Tells You Different Should Be Fired On The Spot. It’s true. Having siding installed on a new home is not the same thing as having your siding replaced. And knowing the difference can save you thousands. New siding installation normally occurs when a home is being built. When a new home is being built, it is quite easy to see the underlying frame and sheathing and know (at an instant) whether your new siding will work. But more importantly, with new home siding installation, there are no “hidden” surprises. It’s a fresh, clean start. And that is why new siding installation can (and should) be quoted at a lesser rate than siding replacement. You see, when it comes to siding replacement, you NEVER know what you are going to find when you remove the old siding. 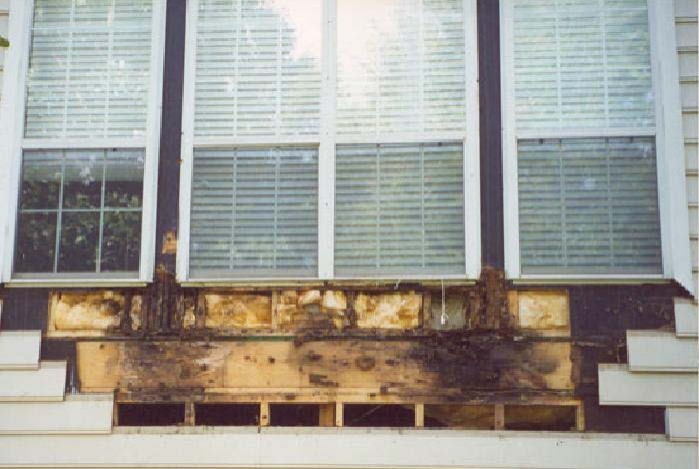 As you can see, once the old siding was removed, sever mold and dry rot damage was discovered. This of course led to whole other set of problems. Unfortunately, we see this all the time here in the Pacific Northwest. Siding expands and contracts a great deal. So much so that you simply cannot screw the siding in. You have to “hang” the siding so that it can expand and contract. And if it is not done correctly, it leaves gaps that allow water to seep through. And this is the end result. Also, many times we are called out to look at replacing someone’s siding. But unlike other contractors who would gladly “upsell” you to a whole new siding job, we’re the first ones to tell you if you can easily remedy your situation with a repair and new paint job. Many times, we can bring your old siding back to life and save you thousands…if not tens of thousands of dollars. Don’t risk your home…or your wallet. Call Titan Exteriors today and let us give you a good, Gods honest report on the condition of your siding and what we can do to fix it.